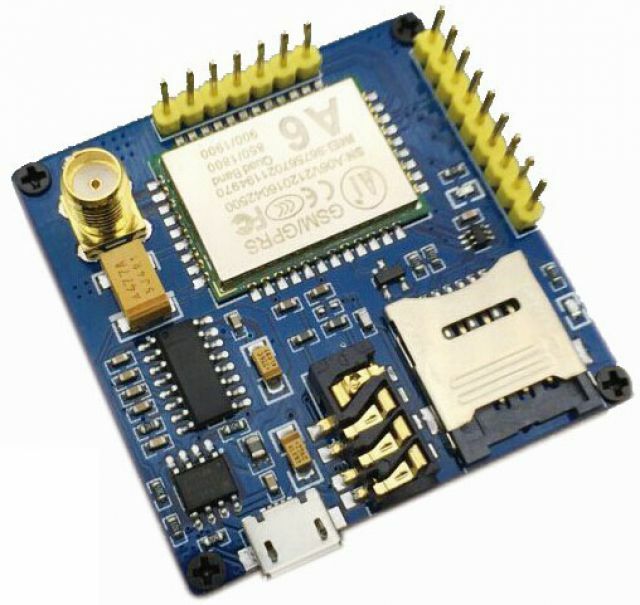 After figuring out that using a M590E module (see here) in North America was out of the question so I ordered some A6 modules and also a couple A6 dev boards to speed up testing. The dev boards arrived first. I connected it to an FTDI breakout so I could talk to it via serial. Hooked up 5V to the VCC_IN pin and ground to the GND pin. The TX and RX from the FTDI board connected to U_RXD and U_TXD on the A6 dev board. The A6 was set to 115200 baud. Just supplying power and waiting a few seconds showed some signs of life right away on a serial console. I'm hoping the "+CIEV: service, 1" or the "+CREG: 1" means it connected to / registered on the cellular network (I had an active SIM card in it). Also it seems to have fetched the date and time from somewhere so that also hints that it's registered on something! This was the response and my phone rang! In order to send an SMS will require some hex codes and control characters to be sent so it's time to hook this thing up to a microcontroller. Next page : hooking up an arduino.